For web references, readers may wish to consult the National Park Service page on the Wilderness before visiting. There is considerable pressure on the battlefield from residential development, and more recently a proposed Wal-Mart shopping center nearby. 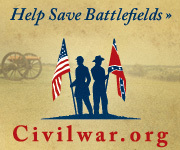 The Civil War Preservation Trust offers details about the later, in addition to some excellent resources and maps about the battle on their Wilderness site. Federal Rear (list) (map) – covering Germanna Ford, Grant’s Headquarters, Ellwood, and the Wilderness Tavern. Gordon Flank Attack Trail (list) (map) – Subject of a previous post. Related set includes the Wilderness Shelter exhibits. Hill-Ewell Drive (list) (map) – Follows the park road from Constitution Highway (the old Orange Turnpike). Widow Tapp’s Fields (list) (map) – Some overlap with Hill-Ewell Drive, but covering this important sector of the battle. Brock Road-Orange Plank Road (list) (map) – Covering Longstreet’s flank attack and the strategic intersection of these two Wilderness Roads. Overall I’ve found the Wilderness Battlefield stops much less frequented than some of the other sections of the park, particularly Fredericksburg. However, the traffic in and around the subdivisions is at times heavy, pressuring the visitor who likes to pull off at unmarked locations. As with other battlefields, the park service has a solid solution for this problem – a series of trails that open up the real heart of the battlefield. In researching my family tree I became re-acquainted with the fact my great, great, great grandfather was Emanuel Shoemaker. He was killed on the first day under Warren in the 1st Maryland Infantry Co. A. I am possibly interested in assisting/volunteering with the battlefield. Also interested in doing some research for my records.